Can you smoke on cruise ships? Discussions about the touchy topic of smoking on cruise ships can turn downright nasty in a heartbeat, and nothing can cause friction between neighbors like a smoky balcony. Whether you want to be able to smoke, or you prefer to avoid smoke, it's important to know your cruise line's policies before you board. What are the best choices for adamant nonsmokers? All cruise lines forbid smoking in interior public spaces, cabins, and any area likely to be populated by children, and most lines now forbid smoking from private balconies, too, so this is good news for those that don't want smoke wafting their way. If this is an important issue for you, we suggest you read our handy chart before you book. Allowed: Designated smoking area on the starboard forward section of the pool deck. Not Allowed: Anywhere else onboard, including cabins and verandas. Electronic Cigarettes: Same rules apply. Allowed: Designated areas within the casino, certain sections of open decks on all vessels, and the nightclubs except on Sunshine, Vista, and Horizon. Not Allowed: Cabins, verandas, and all other public spaces. Allowed: Smoking is only allowed in designated outdoor areas of the ship. Allowed: The indoor "Cigar Lounge" areas, designated smoking areas outdoors, and private verandas. Pipes and cigars may only be smoked in designated areas. Not Allowed: Anywhere else onboard, including cabins. Electronic Cigarettes: May be used in cabins, on private verandas, and designated "Cigar Lounge" areas. Allowed: Indoor smoking is only permitted in the Connoisseur Club smoking lounge and the VIP casino during play. Outdoor smoking is permitted on most decks, except areas of the lido deck. Allowed: Churchill’s Cigar Lounge is dedicated for cigars and pipes. Otherwise, designated areas of the open decks. Allowed: Designated areas on open decks. Allowed: Designated outdoor and indoor areas, including the casino and Sea View Bar/Pool. Electronic Cigarettes: May be used in cabins and other designated smoking areas, but not on private verandas. Allowed: Several bars on each ship and on one side of the main outdoor pool deck areas. Not Allowed: Cabins, verandas, restaurants, and all other public areas. Allowed: Casinos (players only), smoking lounge, and in designated areas on the open decks. On ships with The Waterfront, smoking is also allowed on the starboard side. Allowed: Forward starboard corner of the pool deck on Deck 9, and in the aft, port corner of Horizons on Deck 10. Cigar and pipe smoking is only permitted on the forward starboard corner of the pool deck. Allowed: Cigar lounges, a designated area of the nightclub and casino, as well as certain areas on open decks. Guests in the casino at designated slot machines may also smoke while playing. Not Allowed: Anywhere else onboard, including cabins, verandas, and table games in the casino. 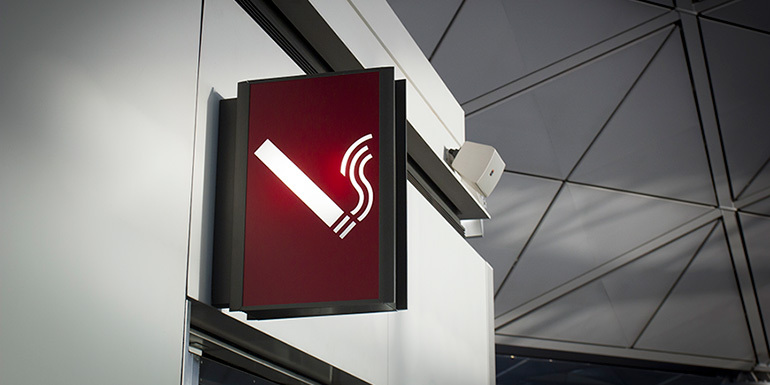 Electronic Cigarettes: Permitted in cabins and designated smoking areas. Allowed: Designated area by the outdoor pool (opposite the bar), Connoisseur Club, Horizon Lounge, and Galileo’s. Cigar smoking is only permitted in the Connoisseur Club and the designated outdoor area, and pipe smoking is only allowed in the Connoisseur Club. Electronic Cigarettes: Permitted throughout the ship with the exception of all dining areas. Allowed: Designated areas on the starboard side of the ship and the casino. Pipes and cigars are only permitted in the cigar lounge and other designated outdoor areas. Not Allowed: Cabins, verandas, the Boardwalk, Central Park, and all other public spaces. Allowed: The starboard side of the Sky Bar on deck 9, and the starboard side of the open terrace aft of The Club on deck 5. Cigarettes, pipes, and cigars are all allowed on the starboard side of the open terrace aft of Seabourn Square on deck 7. Not Allowed: Indoor public spaces, cabins, verandas, and anywhere else onboard. Electronic Cigarettes: Cabins and the designated outdoor areas. Allowed: The Connoisseur’s Corner, certain tables and seating outside Panorama Lounge and Pool Bar, and specifically designated areas of the open decks. Allowed: The designated outdoor area on the starboard side of deck 8. Allowed: Open decks in specifically designated areas. This article was updated on March 15, 2017. Should electronic cigarettes be treated differently than regular cigarettes? As of February, 2015, Princess now treats E-Cigs the same as cigarettes, except they may be used in the staterooms (not on the balcony or other public areas unless a designated smoking area). Thanks for the updates! We've updated the information for Carnival and Royal Caribbean and verified that there are no other changes on other lines. Carnival changed their policy in October. No smoking on balconies. This is an old article, Royal Caribbean I know changed their policy in Jan 2014.